My son's preschool has an adorable version of this Mr. Potato Head dice game... so I thought it would be fun to tweak it a bit and make a Snowman one! 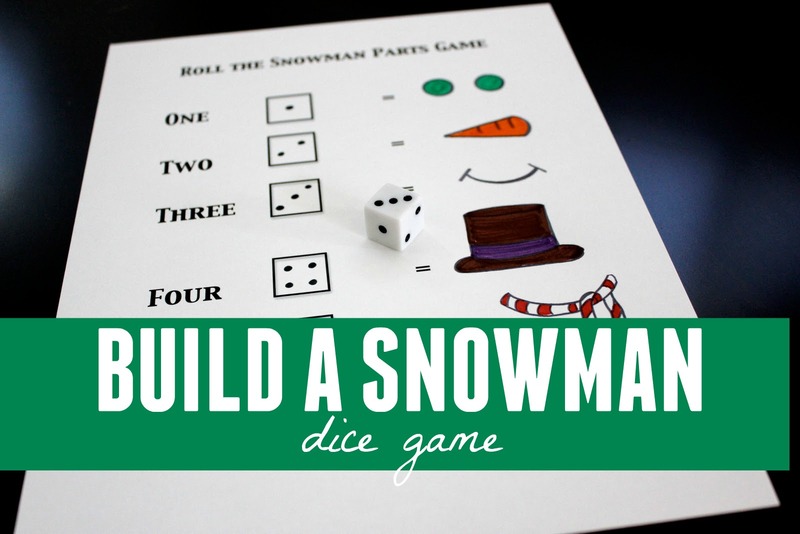 Today I am excited to share this simple build a snowman dice game you can use to help kids explore numbers! The goal of the game is to BUILD your SNOWMAN! This is a fun game to play with a partner, so print out at least 2 copies of everything. It is best if you laminate the pieces before you use them. Materials Needed: snowman parts printable, dice parts cheat sheet, dice, scissors, snowman body template, and a large Ziploc bag to hold the pieces when you are done. 1. Grab your dice parts cheat sheet and snowman parts sheet and color them in. Then cut out the body parts. Laminate them to make them more durable. 2. Lay out the parts next to your dice cheat sheet. Each child needs a dice cheat sheet, a snowman template, and a set of snowman body parts. 3. Take turns rolling the dice. When it is your turn, roll the die and then add the body parts that the number tells you. For example, #1 = eyes... so the child would add both green eyes if they rolled a 1. 4. Pass the die to the next child and let them roll. I would recommend playing this game in pairs or groups of three. Groups of more than three requires kids to wait a lot of time for their turn! 5. Add body parts on each roll. If you roll a number that you have already rolled, pass the die to the next friend. Your turn is skipped. The game can be competitive if you want... and the child that finishes building their snowman first can be the winner. I typically try to avoid talking about winners too much with 2-3 yr olds because that usually means that there was a loser... and most kids that age aren't really ready for that sort of play yet... so be aware of that as you decide how to play. We stored all the pieces in a large ziploc bag (along with a smaller version of the dice cheat sheets). You could easily have kids work on teams together to build their snowmen, instead of having each child work individually. If you want to draw six more parts you could even use two dice and have the kids add the numbers together. This little game was the hit of preschool the other day, so I'm sure your little ones will love it too. It is such a fun way to introduce numbers and counting! In addition to playing our snowman game today, we finally put our Christmas tree up! I am hoping my daughter doesn't maul it when she sees it in the morning. It is smack dab in the center of our playroom and I refuse to clutter the room with baby gates. I plan to keep the ornaments up high and just have soft or unbreakable ones down low. Wish me luck. By the way, if you haven't checked out our awesome giveaway by Craftprojectideas.com... head over now. The Ultimate Box of Projects is sure to be a hit at your house! This is SO AWESOME! I think this is my most favorite activity have seen the past week. I shared this on Facebook, and pinned it..I'm a speech pathologist and this would be AWESOME to do with my speech students....not to mention with my own daughter!! Thanks Katie! Let me know how it goes when you try it with students. My son loved it. I'll head on over and link up later today. Thanks for stopping by! YAY! Thanks for linking up! I'll let you know when I use the activity (I'm on maternity leave right now) I might use it in January when I start working again! My son is all about Frosty right now, so I know he would love this! Stopping by from Sunday Showcase. So cute, but I couldn't get the links to open. Weird @Time $ Kindergarten! Did you go to the scribd site and download the pdf files? Try that and if it doesn't work, I can email the files to you. It is working for me and the few other people who have tried to download them, so I am sorry it isn't working for you! I am not able to download the files. How else can I get them? What a brilliant idea and fun DIY game! Thanks for sharing your cute ideas. Will you please email me the pdf for this snowman game. For some reason I can't get anything to print out. Hi! This is such a cute idea, but how do you get the pages to print? Hi Kristin- It should work easily. You click on the links to the scribd documents. Then you have to DOWNLOAD them. Once they are downloaded pdf files on your computer then you just print them. Email me if you have any other questions. Thanks for stopping by! I would love for you to lnk this up to my Christmas Traditions Link Up tomorrow! I'm doing this for Grace's kinder Winter Party. Thanks for the great idea!! Love Toddler Approved! Thank you so much for sharing your talent and ideas with us!! I don't have any little ones at home anymore, but we have some friends coming over for the holidays. These will be perfect!! Thanks again! My son and I love this game. better than the ones you buy!!! I can not print the cheat sheet. Any suggestions on how else I can get it.